Sometimes you run across something quite by serendipity, and it turns out to be brilliant. I was browsing around youtube last week as I was curled up in my chair with a quilt waiting for the anesthetic to wear off from the dental work I had to have. I hate that miserable feeling and it usually takes several hours to recover, but my teeth are important and I want to keep them as long as I can. So, I was trying to distract myself with quilting videos. I ran across a Kaye Wood video with a brilliant tip for washing fabric. I tried this later in the week, and was amazed at the results. I am a dedicated fabric washer, I like that it removes any sizing and preshrinks the fabrics. But, it usually makes a mess both in strings and knotting from raveling (no, cutting the corners never works for me) and twisting up the fabric, plus it creates creasing in wrinkles that are difficult to iron out. The idea came from Mary Jane Holcomb in Denison, Texas. Begin by opening up the fabric and refolding it. You need the selvedge edges on the ends. This is really important to be sure that the next steps don’t damage the fabric. So, open it up and refold it in an accordion or fan-fold. I went the extra step of putting the cut ends into a fold, like the picture above. 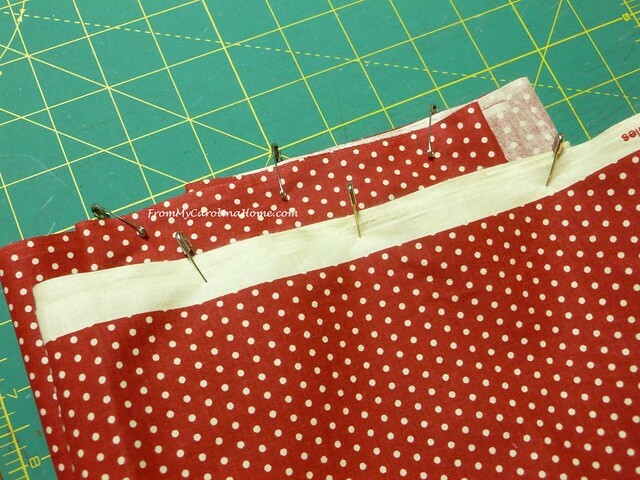 Now, using clean safety pins, pin the edges in several places going through all the layers, every few inches. I used the quilting style pins with the bend in them. One of the comments on the video complained of rust, but I think that person must have used pins with existing rust inside. As long as your pins are clean or new, without rust, this shouldn’t be an issue. I used just three on each end, next time I think I’ll do five. Both ends are pinned through all layers through the selvedge edges. It is important that the pins are in the selvedge ends, if you don’t refold the fabric, the pins could make holes in the fabric. I washed the piece with a couple of towels to make sure it could stand up to the abuse. It came out of the washer like this. Then it went into the dryer, still with the pins in place. It came out like this. No hard wrinkles, no twisting!! 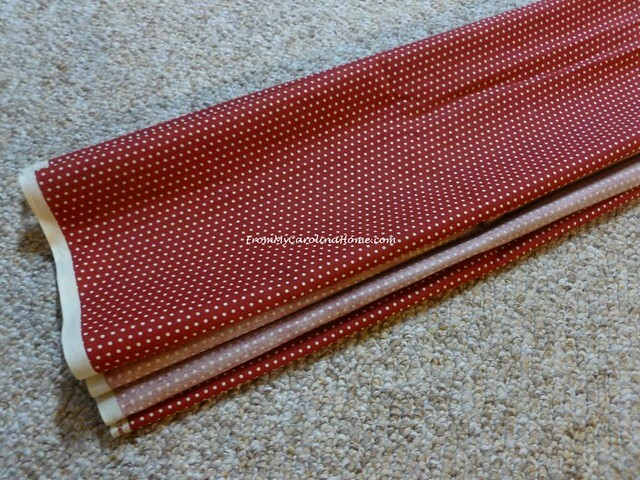 Removing the pins, and laying out the fabric, it doesn’t need any pressing at all. Amazing! Mary Jane says she washes up to 12 yard pieces with no wrinkles, twisting, or raveling!! Of course, you’d need larger safety pins for a thicker folded piece. Here is the original youtube video that I watched. This tip is the first part. The second part of the video is a demonstration of using Golden Threads paper to make disposable quilting templates, so you don’t have to mark the fabric for quilting. Do you pre-wash your fabric yardage? I just got my first implant!!!!! Anyway, I am going to try this out. I do not know which frustrates me more, all of the threads and pulling, or fabric that is just not squared up before and or after washing. Today we are getting a new dishwasher, after a very long wait, this afternoon I am having my very first visit to a retina specialist. I have taken both of my parents to this retina specialist group, and my husband is a regular attendee for over 20 years, so….. it is a three hour appointment — for real! I will bring all of my toys but even the receptionist snickered when I told her of my plans. She said, you will not be able to do much after they give you the drops. oohhh, yeah. I watched this video a couple of years ago. I had smaller pieces so after pinning I then put them into a net washing bag. I also put smaller cut pieces, without pinning, into a net bag before washing – saves all those threads wrapping round anything else 🙂 Thanks for sharing. I pre-wash sometimes but it depends on the fabric and if I think it will bleed. I get a lot of pre-cuts and it suggest that you do not pre-wash. I will certainly have to try that! I do sometimes, esp if I’m mixing new and old fabrics, and I used to religiously wash everything. But I like to pick up clearance pre-cuts so prewashing is out for everything but fat quarters and larger, they just go completely out of shape. I do wash my baby quilts before gifting, with a color catcher, and I’ve not had an issue. I am going to try this after my next stash replenishment! Great tip! I use to pre-wash all my fabric but have gotten away from it after using precuts. I wash the quilts after they are completed with a color grabber. But I will prewash again at times and I’m going to use this tip as I hate those strings and wads! Thanks for sharing the idea! Great idea, Thank you! I generally pre-wash fabric because I do not like post-wash surprises, either in color or shape. And I will surely try this next time. The lighter colors? Just a thought to consider. Sounds like a great idea, and I will certainly try it. I wash everything, even the precuts! Ha! 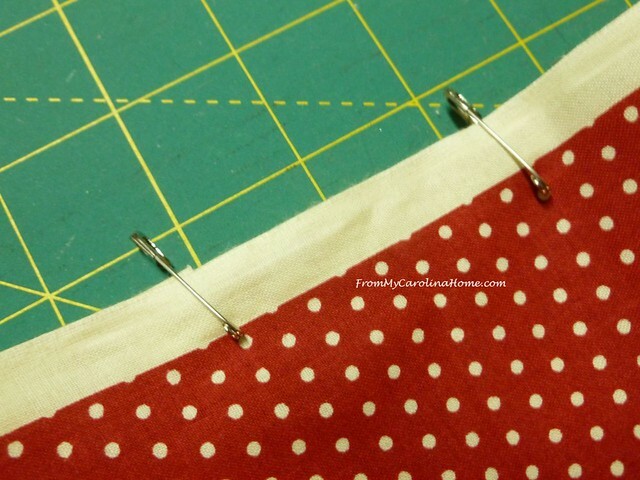 Hate safety pins, but probably easier than whip stitching? A sewing friend serges all her cut edges, but I don’t have a serger. Thanks for passing along the tip. Carole, and hope major dental work is behind you for a while. We had a terrible dental year last year…two root canals & crowns for me and a root canal, crown, and an inplant and crown for DH…but better than the alternative! 54 degrees over night here in St Louis, and sun this morning. What a change! What a great tip! I hate all those snags! 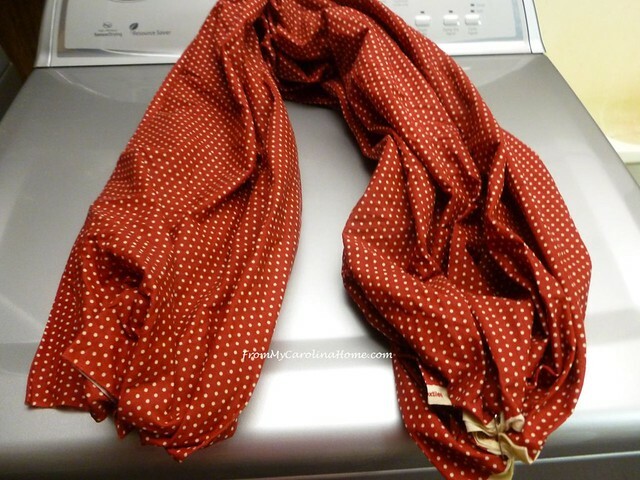 I will try this, I wash tons of thrifted fabric and spend hours smoothing, snipping and folding. Thanks for sharing a great washing tip. Thanks for finding and sharing this. Great tip. What a good tip! 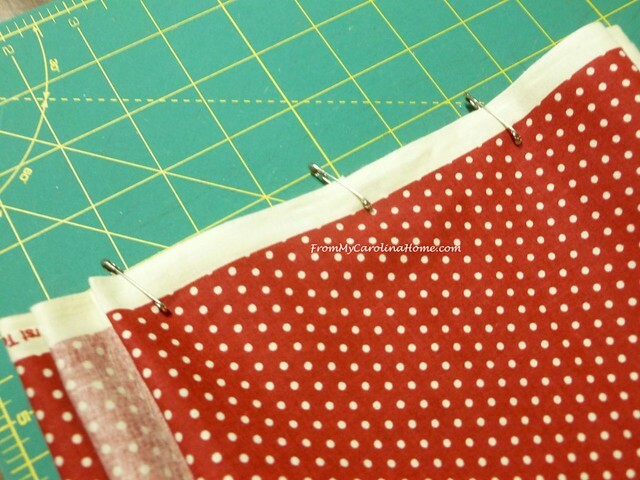 Like you, cutting the corners off of fabric never worked and I found myself very frustrated. Also, thanks for the info on how to get the Square Dance button to work. I’m glad it wasn’t just me. Have a great week! I have always done this. I don’t know if someone had told me or if I just figured it out for myself. I love the fact that the fabric isn’t all twisted up when you pull it out of the washer or the dryer. Some people run a zigzag stitch which to me is just a pain in the rumpus. I’m glad that you came across this tip Carole and that you posted it for everyone to see. I had told Brenda about doing this a long time ago. Well off to go do some sewing since I have to go home this afternoon. The both of us are working on a quilt for Project Linus. Im doing a girl one and she is doing the boy one. Hope you have a great day today Carole. Hello Carole; This is a great tip! Deanna showed me this after she had washed and dried a large yardage amount of fabric for a backing. I was astonished at how fabulous it all came out without wrinkles and shredding. So, just like you, I was hooked on this method of washing/drying fabrics from here on out. Sorry to hear about your dental issues, but understand wanting to save them for as long as possible. I am still trying to figure out my issues, but know it will all work out! Have a great day! If I miss commenting, my lap top crashed and will not be fixed until after the first of the month. Great tip, unfortunately I have some big pieces in the washer right now- should have read this first. My problem is, I can wash new yardage, BUT I get a great quantity of my fabric from donated scraps and washing them would be a logistical nightmare, so I don’t wash them. Have not figured out how to solve this. I am not handwashing 9 million scraps. I have been fan folding and washing fabric 15+years. I pin parallel to one selvedge only. I have not watched the video. Who’d have thought! Great tip that I will have to try. Thanks. Wow! That’s an awesome tip. Thank you for sharing with us. I had never seen this before, but wish I had as it would have saved HOURS of my time. Yes, I do prewash my fabric; most as soon as they hit my back door. If I am purchasing fabrics locally, they are put into the washer almost the second I bring them into my house once they’re separated by colors as best as I can and put the color saver sheets in. They don’t get into my sewing room until they’re washed. I do not open fat quarter bundles to wash those however, and haven’t done any charm packs or smaller sized packs either. 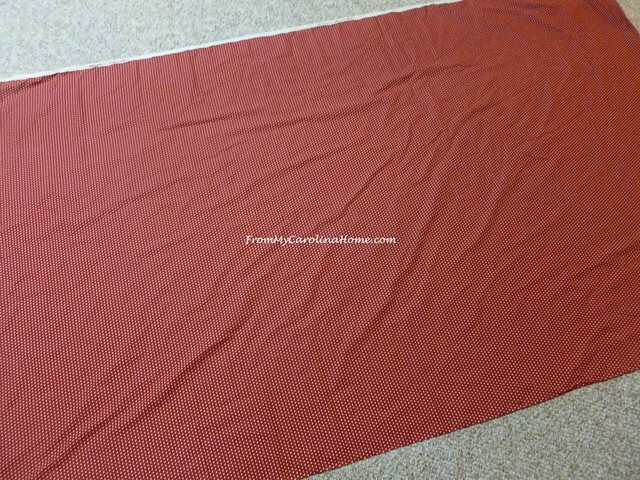 The reason I say this tip would have saved me hours is because after they are all washed and dried, I then ironed each to remove any wrinkles so those won’t be in the folded fabrics, and then folded each around my 6 x 24 inch ruler to make uniform sizes and folded them lengthwise into smaller squares. Doing it that way made it easier for me to store each into the containers I use. Removing the first few steps as I have been doing them, and using the tip you’ve given will be SO much faster. That is an awesome tip! I wash some of my fabrics and always dread having to then iron yards upon yards of wrinkly fabric before I can put it away. What a great tip!!! Certainly will eliminate all the tangles,loose threads, as well as, cutting down on pressing time. Thanks for sharing. I only prewash yardage I use for backing tshirt quilts. My method was to sew the two raw edges together with a zigzag seam before washing (like a big folded tube of fabric). After wash/dry I would just cut off the seam; that means I waste about 1/2″ of fabric but I usually buy a little excess anyway. Thanks for this tip, I’ll try it next time! Thanks for the tip! I do prewash everything if it has color. Big pieces in the washing machine / smaller ones I just soak in hot water in the sink. 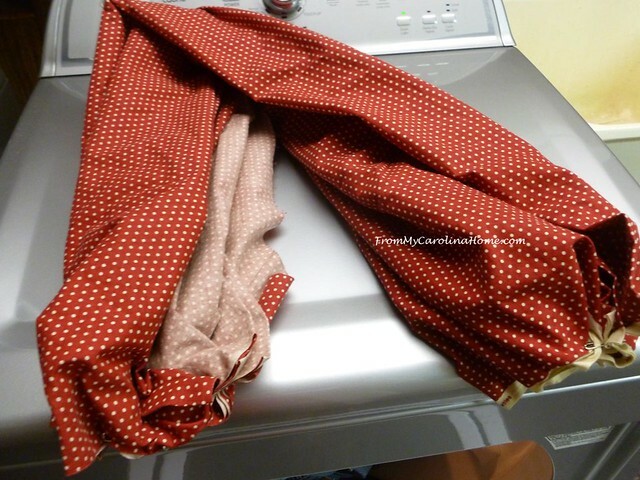 Carole~ Thanks for sharing the tip on washing new fabrics. I have washed for years 20+. After watching my grandmother make beautiful quilts in her favorite browns and reds, and then seeing those colors bleed, I vowed to always wash yardage before use. Then the fabrics are folded around comic book cardboards. It makes for a very uniform storage and display. Thanks for giving us such an informative and entertaining blog. I look forward to it…daily! Thank you for sharing that information. What a great idea!! I am going to try this method of fabric washing as I wash all fabrics also. WordPress now has the widgets under Customize. That works. I had problems using the older software (won’t change now as that usually causes me to have to redo things on wordpress) and it works now. You can also go to your site and look at the bottom right where it says ‘customize’ click on it and look for the widgets. Then proceed copying the text and the link and it should work, although sometimes the software makes me want to scream! On my version of WordPress, the widgets are under Appearance on the left. I refuse to use the ‘new improved easier’ version. Tried your method for washing some large pieces of fabric I wanted to starch (using it for tiny piecing). After washing I took the damp fabric and dipped it into diluted liquid starch then drip dried. Because of the drip drying method I had a few wrinkles, but if it had been dried in the dryer I am sure it would have been better. I will be using your method again. I don’t usually prewash but today I am prewashing flannel for a quilt back for my mom. She will be going into hospice at some future time this year and I wanted something cozy for her. I know flannel shrinks like mad and I knew I read about this on your blog. I prewashed flannel pieces last week-what a mess. Thank you for your tutorials, they are such a help.